Politically blackballed by world public opinion in 1965, hit by an attempted economic strangulation from U.N. imposed trade sanctions and pestered by the inherent problems of a frontier nation struggling with Twentieth Century realities-those were the birth pangs of Rhodesia. Today, the furor has died to a low rumble. As November 11, 1971 rolls around-the sixth year of the nation's independence - Rhodesia is alive and well. THE NINETEEN FIFTIES and early sixties saw the decline and fall of European colonialism in Africa. As European resistance against colonial independence weakened, the current of African nationalism ran stronger and became more traumatic. Sometimes change came in an orderly fashion. But all too often "progress" was spotted with violence and bloodshed, by both black and white. But the stage was set. Africa was now ready to throw off the yoke of European exploitation. And in nearly every colony or territory the end result was the same - the creation of another new and independent African state. In 1964, the three-territory federation of Northern Rhodesia, Southern Rhodesia and Nyasaland were offered independence from Britain. A principle condition required each new republic to be governed by majority rule. Northern Rhodesia (now the Republic of Zambia) and Nyasaland (now the Republic of Malawi) readily agreed to the terms. But Southern Rhodesia, having been a white-controlled, self-governing territory since 1923, refused the British ultimatum and declared a unilateral declaration of independence. British Prime Minister Harold Wilson and his Labor Government were visibly shaken. Not since the Thirteen Colonies in America rebelled against the Crown, had an English colony declared its own independence. World opinion was immediate and fierce. Overnight Rhodesia was labeled a "Rebel Colony." Prime Minister Ian Smith's white-minority government was described as "white supremist" and "racist." Ian Smith was called an outlaw, a hard-headed Scotsman, a dictator - his cabinet was labelled as a pack of Rhodesian cowboys. The Smith Government — along with Rhodesia's 250,000 white citizens - was accused of establishing a police state suppressing the nation's five million black Africans. Many African and Asian countries mounted pressure against the British Government and the United Nations. There were cries to send out the troops! To smash the rebellion through military force! Demands were made for a one-man-one-vote democratic system that would guarantee Rhodesian rule by an African black majority. Yet, the Smith Government stood firm. Britain refused to recognize the new state. Most other nations refused as well. In the hope of forcing the white Rhodesians to change their minds, Britain imposed a trade blockade. The U. N. called for universal trade sanctions. Britain steadfastly refused to use military force against their Rhodesian cousins, despite pressure from other African states to do so, arguing that such a move would be "counterproductive." The sanctions failed. Mozambique and South Africa continued to trade with Rhodesia. Even Zambia was forced to trade with Rhodesia, since at least half of its imports moved on routes crossing Rhodesian territory. During the first years of the sanctions, Rhodesia's overall export trade did register a decline. But by 1969 an upward trend was noted. In 1969, the Smith Government voted to abandon their profession of loyalty to the Queen of England, and proclaimed Rhodesia a republic in March 1970. It appears that the nation of Rhodesia is here to stay, the last ties with Britain having been severed. 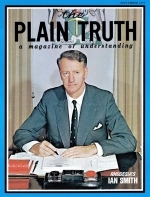 To help bring readers of The PLAIN TRUTH up to date on conditions inside Rhodesia, we publish an exclusive interview with Prime Minister Ian Smith, beginning page 6. Photographs on following pages were taken by PLAIN TRUTH staff photographers. RHODESIA Land of Contrast Rhodesia is a land of pristine, unspoiled beauty, with industrial pollution nearly nonexistent. Downtown Salisbury, population 390,000, is a gleaming and modern city in the Western tradition. Yet, much of the rural population still lives in a stone age culture. Most of Rhodesia's white citizens and a very small, but growing proportion of its black African citizenry live in modest middle class homes. Modern and ancient forms of agriculture survive side by side. Literacy among the whites is universal. There are no statistics available for the bulk of tribal blacks, but the number of literate blacks is gradually increasing as funds for educational facilities become available.